Leaving Nuwara Eliya at 6am we rode through thick fog to begin the long descent. The road was quiet at that early hour. We passed temples, stupas and mosques, some very modest, as well as vegetable fields in this intensely settled and farmed area. We lost altitude quickly and were soon below the clouds. 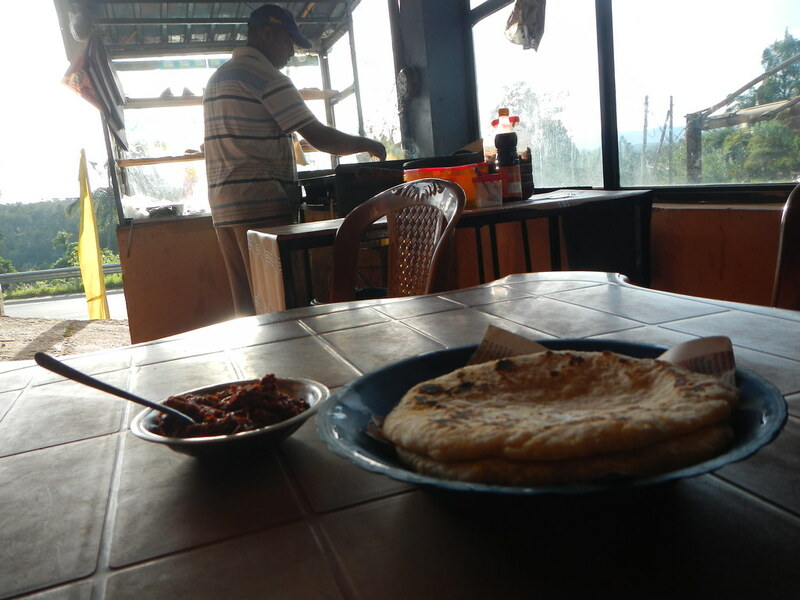 Breakfast was coconut roti with sambal and sweet milky tea in a roadside cafe with view. Our route was initially along a main road, then along quieter secondary roads. Although we had an overall descent of about 1000m it was not downhill all the way. There were some long climbs, some with steep grades that were unrideable. The cooler temperature was therefore appreciated. Eucalypt trees completely dominate the hillsides and lantana is also growing as a pest. Schools are numerous in rural areas and the children call out and wave as we pass. 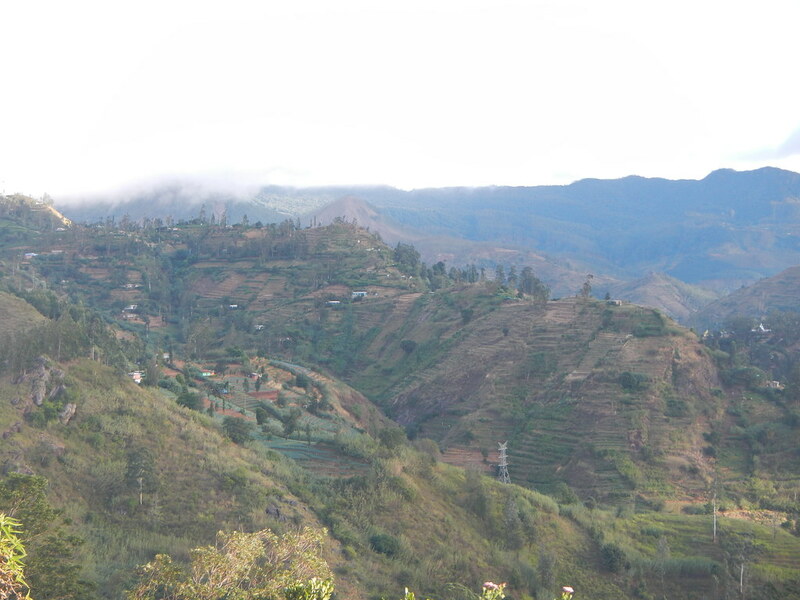 There are many small holdings of tea in contrast to the large plantations we saw yesterday. Milk is collected from small scale producers and delivered to chilling stations. We went through a large area of military establishments with armed guards at the gates and lots of uniformed personnel. The final stretch into the small town of Ella gave spectacular views to the east through Ella Gap to the plains. There’s a zig zag road for the last kilometre that’s quite a challenge for the buses to negotiate. Ella is a backpackers destination with many young travellers from Europe, Australia etc. We are staying at Ella Highest Inn, simple and comfortable, but soon to be the highest no longer. We are still at 1000m elevation and will head for the plains and south coast in the morning. 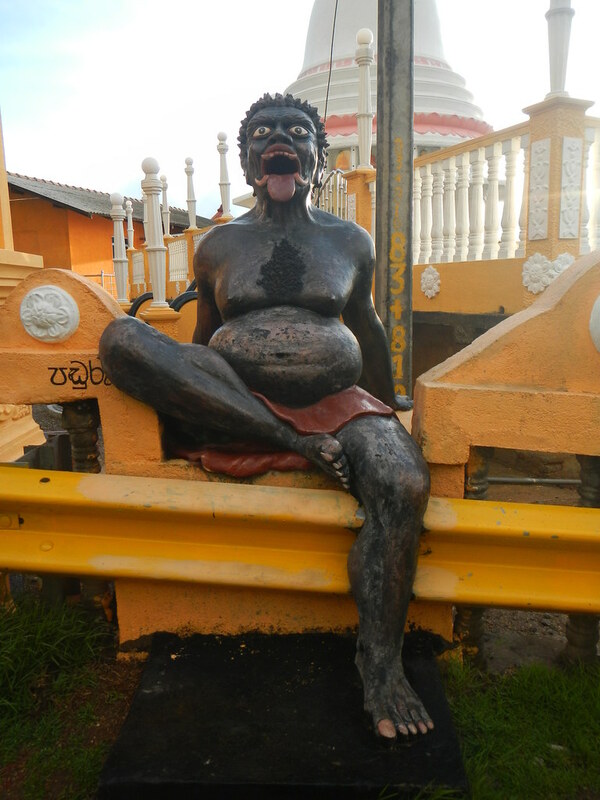 This entry was posted on 18 September 2015 at 4:05 pm and is filed under Sri Lanka. You can follow any responses to this entry through the RSS 2.0 feed. You can leave a response, or trackback from your own site.